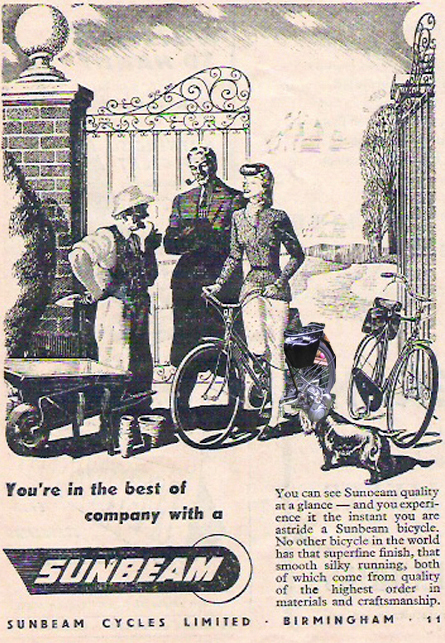 What’s different about the 1948 Ladies Sunbeam pictured below? I hear gasps of incredulity from browsers of this website. It’s sacrilege! Sunbeams are our aristocracy. 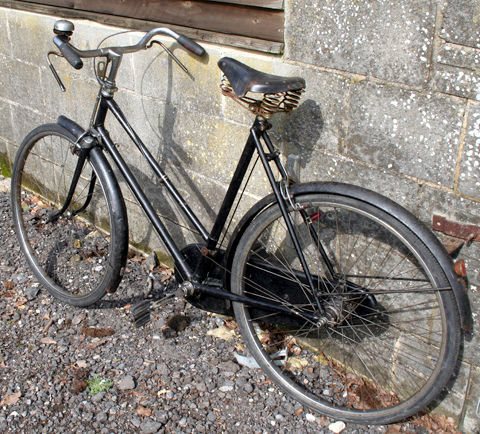 Putting a cyclemotor engine on a Sunbeam bicycle is like the Queen having a new punk hairdo. But wait a minute …this actually looks quite good. And the bike is totally intact. What’s the story? (There’s always a story). And, indeed, off it went, sometime during 2007, with various other old British bikes for Pat to restore. 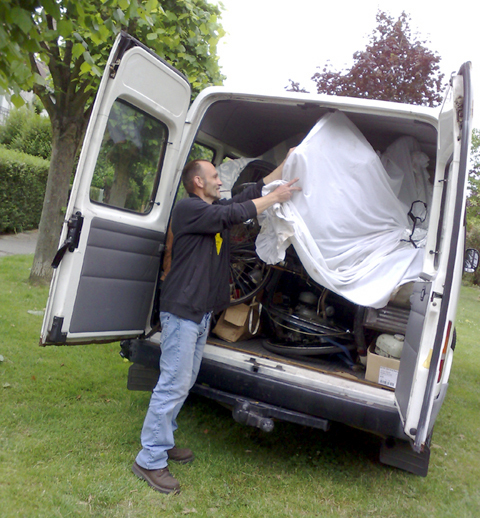 Here’s ‘le Professeur des Cyclomoteurs’ himself, uncovering his latest consignment of cyclemotors and bicycles packed into my van. Meanwhile, I bought the unrestored VAP4 below, and was intrigued by the label on the tank. I could see part of the address of a British agent. When Pat sent me scans of the VAP4 handbook, I realized the partially obscured address was the same as the British agent mentioned below, Frank Lawrence Motor Cycles of Falcon Rd, London, SW11. And I later found this article in ‘The Motor Cycle’ of 18th May 1950, which mentions Frank Lawrence too. I sent the engine and tank over to Pat for him to restore. Having restored the VAP4, we had to decide on what cycle to mount it. I always wondered what cyclemotor might fit onto a Sunbeam without damaging the bike. Pat rose to the challenge. He still had this bike in his garage, so the VAP4 now has a unique mount, the 1948 Ladies Sunbeam. Pat could not resist the urge to add a further Gallic touch to the bike, so as well as a very efficient motor, it now sports some superb pin-striping too. I have few small jobs left to do on the bike, such as fitting transfers. I’m totally delighted with this project. It’s a good example of how my friends and I waste most of our time and money. And why a Ladies Sunbeam?